Deciding on furniture for your office should be a fun experience — a creative outlet to express your corporate culture and communicate your brand values. However, it can also be overwhelming. But it doesn’t have to be. With the right furniture partner, no matter how big or small your office design project is, curating a well-appointed furniture collection can be a rewarding experience. To help ensure the best working experience for your employees, we’ve put together a furniture checklist to get the most out of your workplace partner. 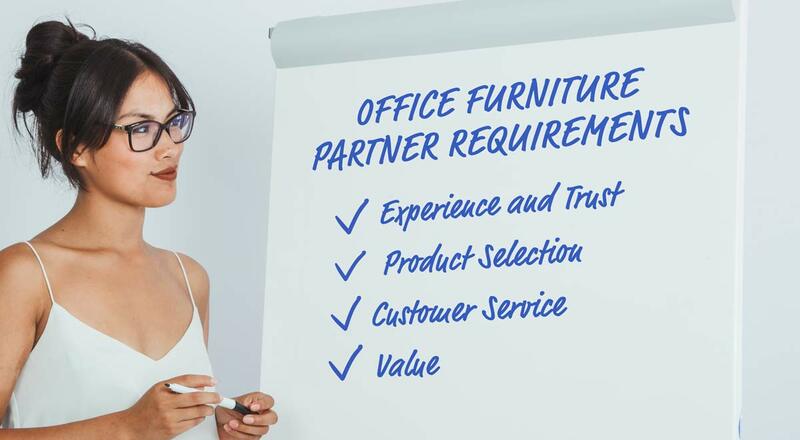 Experience counts when it comes to working with a furniture partner. Approach your furniture wholesaler and designer as an extension of your design team. Equipped with the knowledge on the latest office trends and skilled in project management, they’ll be able to translate your furniture needs into practical, functional design, delivered on time and on budget. In today’s personalized-centric world, having a variety of furniture options is a must. While most workstations are cookie-cutter, social and collaboration areas can be primed for your unique culture. Work with a partner who has access to reputable furniture brands and can offer customizable solutions to fit your agile office needs. Anticipating the need for curated products, we launched Platform by Unisource Solutions, our in house design and manufacturing arm. We understand that workplace design is evolving into a more balanced office with companies blending the comforts of of home with the amenities of a corporate environment. Our new division allows us to offer customized design solutions to fit your budget and your timeline. With many construction projects, working with an on-point, engaged team is the recipe for success. Work with firms who have a strong account management team and a stellar customer support staff. Not only will they help mitigate logistical issues, they’ll also be able to offer design insight to make your project uniquely yours. Value comes in all sizes. From competitive pricing to shorter lead times and having a design-eye. Evaluate your furniture partner on the three E’s to determine their added value. 1. Does your furniture partner encourage you to communicate your culture through design. 2. Do you feel empowered to achieve affordable design solutions with a sense of ease and control. 3. Does your furniture partner help elevate your workplace style to better serve employees. Answering yes to these three questions will pave the path to a successful project. We’d love to be part of your next office design project! Drop us a line. Contact us for more information about how we can help pick the right office furniture partner.